This is a pattern with a difference. There are no printable pattern pieces. You make the pattern pieces from cutting up plastic canvas sheets and circles following measurements in a chart. 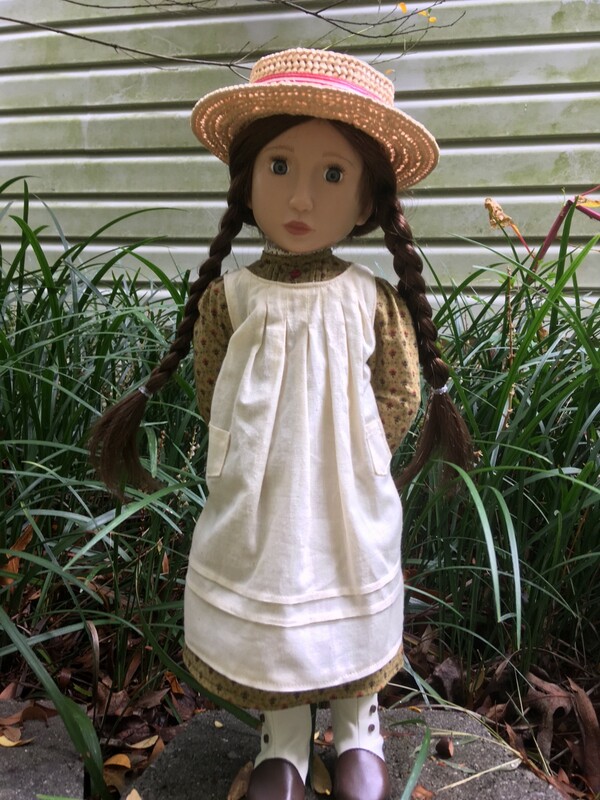 The chart includes accurate measurements for 9 different popular doll sizes up to 12.25" head circumference, and the pattern includes full instructions for measuring your doll to create additional size hats if required. So what is a boater? A boater is a hard straw hat with a flat top and a medium sized hard brim. It is made from braided straw. For real boater hats, the hard structure of the hat is achieved by varnishing the hat after it is steamed into shape. 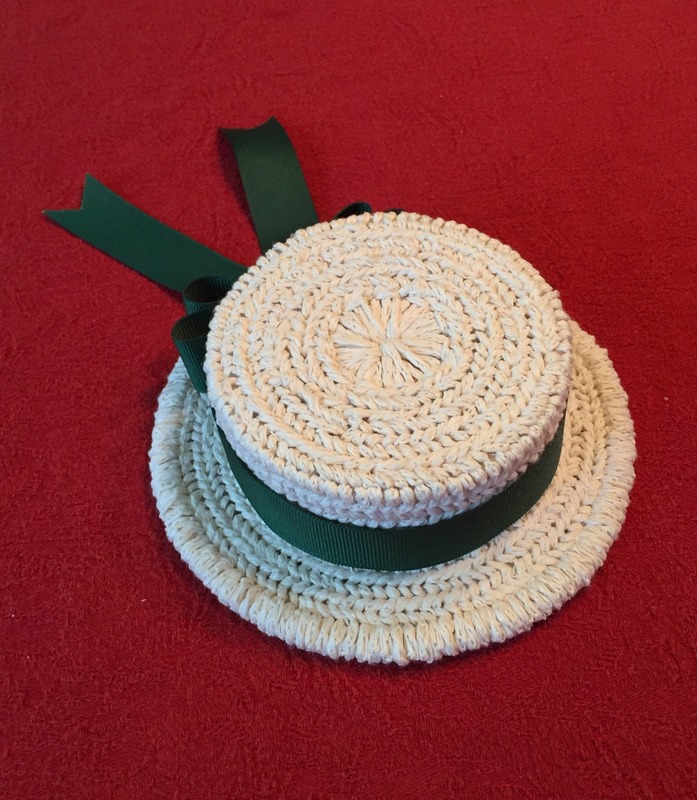 The hat you will make from this tutorial doesn’t need to be varnished to achieve its solid construction, as it is made by embroidering with raffia yarn or ribbon on a plastic canvas structure. 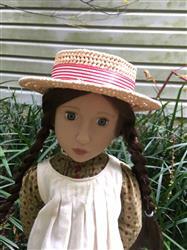 The doll’s hair style and wig thickness will affect the fit of this pattern. Please measure your doll’s head carefully before cutting the plastic canvas circles. The hats were called “boaters” because they were summer hats, often worn for boating on the river. Some people suggest that the hats are descended from the wider brimmed straw hats worn by sailors and gondoliers in the 18th and early 19th centuries, but those hats were not as rigid as a traditional boater hat. It is somewhat surprising that straw hats became summer accessories in England, as the British Isles are not famed for a dry climate and in general straw hats do not survive well in the rain. But Boaters are more stable than the average straw hat because of the heavy varnish finish and double layers of braided straw. Children had been wearing straw hats with sailor suits since 1846 when the young Bertie (later Edward VII) was given a sailor outfit as a gift. Prince Albert commissioned a painting of the young prince in his sailor outfit as a Christmas gift for Queen Victoria, and thereafter nautical outfits including straw hats became very popular outfits for both boys and girls. Women wore boater hats as a fashion accessory since the late 1880s, when it was popularized by the “Gibson Girl” fashion plates. The boater continued to be a popular style with women until the 1950s. In Late Victorian (1880 - 1901) and Edwardian times (1901-1911) boaters were worn by both genders. Edwardian gentlemen usually wore them with a striped blazer jacket, an open-necked white shirt, and white or cream flannel pants. A silk cravat matching the striped blazer was often added as a final touch. The boater hat reached the peak of its popularity as a men’s fashion accessory in the late 1920s and early 1930s, where it was de rigeur for young gentlemen in the summer months. After WWII, the boater became less popular for men’s headgear as British society became more egalitarian and hats were not worn in public as much as they had been before the War. Believe it or not, boaters are still worn today. As well as being fashion accessories, they are also often part of the uniform of private schools in Britain, Australia and New Zealand, as well as some other countries. They are primarily worn by girls as summer school uniform head gear, but boys do wear them too. As a child, I lived near the famous Harrow School. The boys at Harrow School wear natural straw boater hats with a black ribbon band as part of their every day school uniform. The school is spread out between buildings over a large area across Harrow Hill, and if a boy is seen by a teacher without his boater he is fined or given a punishment of writing out lines for wearing incomplete school uniform! The boys from Harrow School say you can tell the age of a natural straw boater by its color. The varnish darkens with age. Usually only the new boys who didn’t have a family member at the school before them will have brand new store-bought boaters. The boys who come from old Harrovian families tend to pass the hats down from father to son. 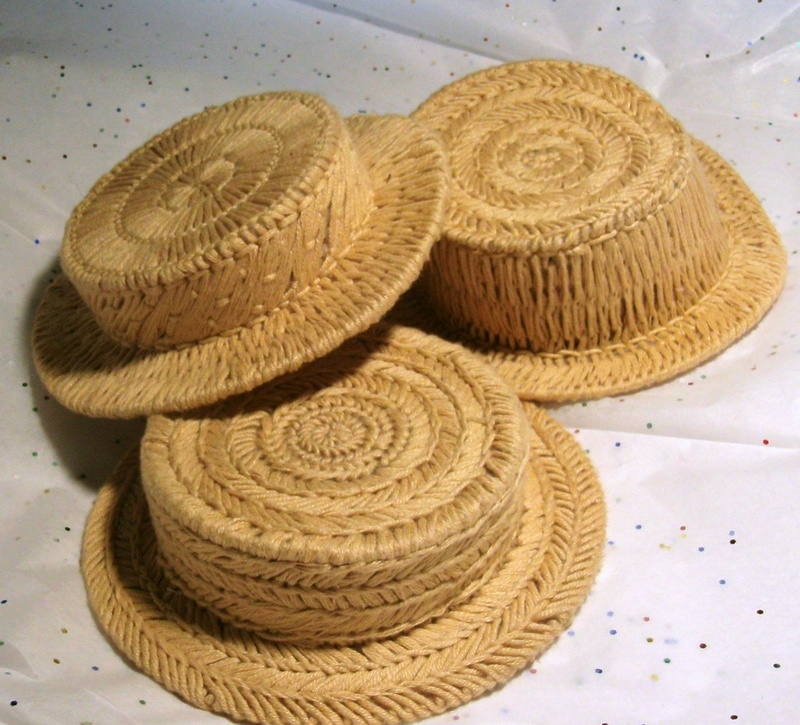 Usually a boater would be made in a natural straw color. But boaters made in other colors than natural straw were very popular with women. Black and navy blue were in demand in the Gibson Girl era, particularly in England where Queen Victoria remained in mourning for the rest of her life after the death of Prince Albert. Pastel shades of dyed straw boaters were commonly worn as Sunday hats for younger girls up to the end of the 1950s. Recommended Fabrics: Plastic Canvas sheets and circles. Raffia knitting yarn, ribbon yarn or 1/8" ribbon . The hat shell can also be covered in felt or other fabrics if desired. 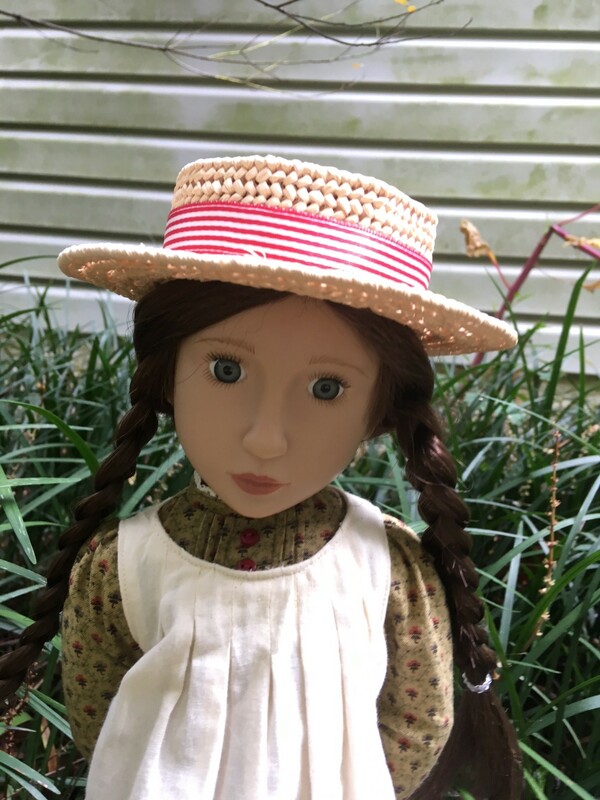 If you wish to make hat for a doll with a larger head circumference, then you will need to buy larger plastic canvas circles, e.g. 9" or 12" diameter. - Sharp scissors – please do not use your needlework or sewing scissors to cut the plastic canvas as it will dull the blades. - Emery paper, you can use this to file off any sharp edges or molding parts you find as you’re working with the plastic canvas. - A sharp-pointed marker pen will also be handy. - Spare yarn for temporarily tying the pieces together when constructing the hat. What You Get: One 34 page sewing pattern that you digitally download as a PDF file so you can start your project immediately! The PDF sewing pattern provides full color step-by-step illustrated instructions and full size pattern pieces. This pattern includes a 4 page Summary of Instructions section so you can print out just the text version if desired to save on printer ink! A PDF reader is required to view and print the files (example: Adobe Reader or Preview for MAC). The download link is received immediately after the transaction is complete. Print copies are NOT available. Victorian and Edwardian Boater Hat pattern. This project calls for a lot of patience and attention to detail. It is very labor intensive and I found it difficult to hide the yarn tails neatly. However, I am excited how it turned out. Thank you for this unique pattern. I bought this pattern to make a Mary Poppins hat. I used a navy blue “Woody” yarn. I think it turned out to be adorable. Now to find daisies and cherries for the embellishments! Also ordered the Kng Cole raffia to try a “straw” version. 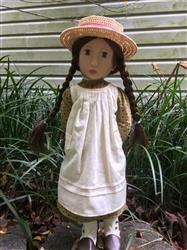 I am very fond of creating costumes for dolls (rather than day-to-day clothing) and I prefer to make complete outfits. This style of hat has been around for so long it nd has become an iconic accessory for many looks. I was initially intrigued by the pattern and description and I am thoroughly delighted with this purchase! I found the pattern's descriptions and instructions thorough and well thought out and I really appreciated the designers suggestions for variations. I didn't actually use the raffia yarn, as the pattern mentioned but, only because of my own lack of patience with the material. (the fraying drove me nuts) ;-) Instead, I used a straw-colored, cotton yarn and was very pleased with the final look. I might try using a shellac or varnish to see if that will enhance the finish. I've already started playing with the dimensions a bit, experimenting with different looks. (the top right hat has a higher, tapered crown which added a nice little dip in the brim) and am working on a few more. Thank you, Genniewren Designs! 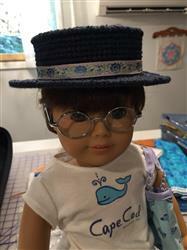 This pattern fits any size doll that is 18” or smaller. You won’t believe it, but this is made from plastic canvas and raffia yarn (not raffia from the craft store). I had to order my raffia yarn off Amazon, but it was totally worth it. The spool I ordered was enough to do an AG sized hat, an AGAT sized hat and most if a H4H sized hat. I loved having this hat to take with me when my kids were at events, it made the perfect portable project. It is also great work on while watching TV. People can’t believe that I made it because it looks just like a straw hat! The perfect finishing touch to you Edwardian or Victorian outfit!